This article is about the "Northern Barbarians" (北狄). For Beidi as the "Northern Deity" (北帝), see Heidi. 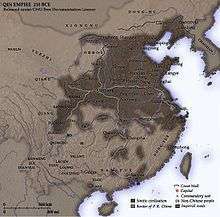 The Beidi or Northern Di (Chinese: 北狄; pinyin: Běidí; Wade–Giles: Pei-ti; literally: "Northern Barbarians") was a term referring to various ethnic groups who lived in northern China during the Zhou Dynasty. By the end of the dynasty they were mostly conquered or absorbed by the Chinese. The ancient Chinese classed their neighbors by compass direction as the Siyi (四夷) "Four Barbarians", comprising the Beidi, Nanman, Dongyi and Xirong. The four names, or combinations of them like 'Yi-Di' are often used to mean "barbarians". The Liji "Record of Rites" details ancient stereotypes about the Siyi "Four Barbarians" surrounding China. The people of those five regions – the Middle states, and the [Rong], [Yi], (and other wild tribes round them) – had all their several natures, which they could not be made to alter. The tribes on the east were called [Yi]. They had their hair unbound, and tattooed their bodies. Some of them ate their food without its being cooked. Those on the south were called Man. They tattooed their foreheads, and had their feet turned in towards each other. Some of them (also) ate their food without its being cooked. Those on the west were called [Rong]. They had their hair unbound, and wore skins. Some of them did not eat grain-food. Those on the north were called [Di]. They wore skins of animals and birds, and dwelt in caves. Some of them also did not eat grain-food. The people of the Middle states, and of those [Yi], Man, [Rong], and [Di], all had their dwellings, where they lived at ease; their flavours which they preferred; the clothes suitable for them; their proper implements for use; and their vessels which they prepared in abundance. In those five regions, the languages of the people were not mutually intelligible, and their likings and desires were different. To make what was in their minds apprehended, and to communicate their likings and desires, (there were officers) – in the east, called transmitters; in the south, representationists; in the west, [Di-dis]; and in the north, interpreters. The Di seem to have lived in a horizontal band from the upper Ordos Loop and across northern Shanxi to the state of Yan north of Beijing. This area was a transition zone between the emerging Chinese civilization and the steppe peoples to the north. They seem to have practiced a mixed pastoral, agricultural and hunting economy. Other groups of Di seem to have lived interspersed between the Chinese states. To their north was the emerging steppe society whom the Chinese later called Hu. To the southwest the Rong lived along the northwest frontier of China. The Di and Rong are often associated and both were considered more warlike and less civilized than the Yi and Man. The Di had walled towns and fought on foot. They were often enemies and sometimes allies of the various Chinese states. We hear of trade, treaties, marriage alliances and Chinese politicians fleeing to exile among the Di. According to the Records of the Grand Historian, the ancestors of the Zhou dynasty lived in lands near the Rong and Di for fourteen generations, until Gugong Danfu led then away to the mid-Wei River valley where they built their capital near Mount Qi. 676-651 BC: Duke Xian of Jin conquered a number of Rong and Di groups. 662 BC: The Di drove the Rong out of Taiyuan. 662-659 BC: The state of Xing was nearly destroyed by the Red Di until it was rescued by the State of Qi. 660 BC: The Red Di took the capital of the State of Wey and killed its ruler, but were driven out by Qi. 660 to 507 BC: Jin fought many wars with the Di. 640 BC: The Di were allied with Qi and Xing against Wey. 636 BC: The Di helped the Zhou king against the state of Cheng. 541 BC: Jin 'subjugated' the Red Di state of Lushi. 531 BC: Jin attacked the Xianyu and Fei. 507 BC: Jin was severely defeated by the Xianyu Di. 406 BC: Zhongshan was conquered by the State of Wei. 400 BC: By then most of the Di and Rong had been eliminated as independent polities. 377 BC: Zhongshan regained its independence. 295 BC: Zhongshan was conquered by the State of Zhao. Circa 283-265 BC: Tian Dan fought with Di who lived in the state of Qi. The Bai (White) Di lived in the west and the more warlike Chi (Red) Di to the east. The northern state of Zhongshan was founded by the Bai Di. It adopted Chinese material culture but was never considered properly Huaxia (Chinese). Other Di groups were the Chang Di and Xianyu. The state of Fei and the Xianyu were part of the White Di confederation.